This set of IDaids is the promised follow-up to the June article we published on Xanthomonas pathovars. These pathovars (pathogenic varieties within a species, abbreviated “pv.”) are characteristically host specific; Xanthomonas axonopodis pv. citri and Xanthomonas axonopodis pv. 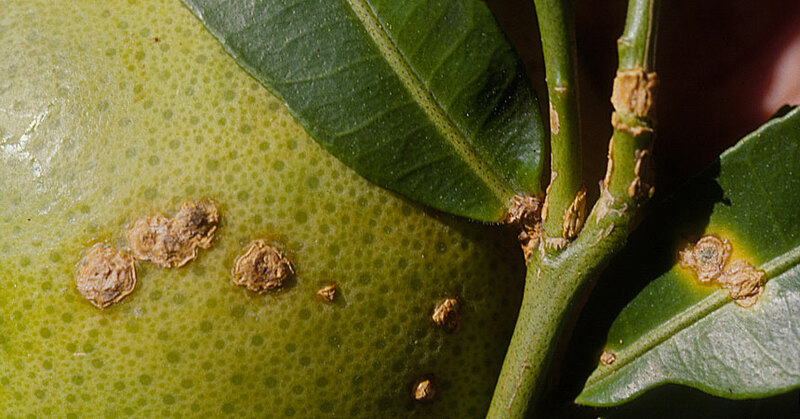 aurantifolii both cause citrus canker, one of the most serious citrus diseases found in the United States. Detection of either of these pathovars can lead to establishing and/or expanding quarantined areas to quickly contain the bacteria, as seen with two recent federal orders in both Texas and Louisiana. 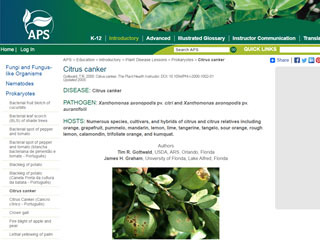 This database contains a “picture gallery” and molecular sequences of Xanthomonas pathogenic strains affecting citrus. Click on a strain to access the sequences, as well as classification, host plant, geographic origin, and other information. 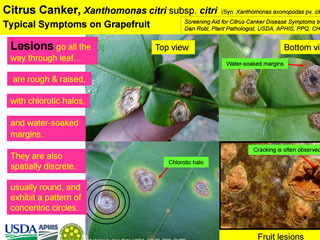 Here is a PDF screening aid with helpful, annotated symptomatic images of leaf top and bottom views and fruit lesions as seen on grapefruit. 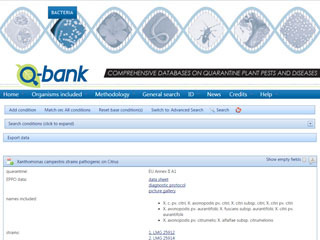 This page describes signs and symptoms, pathogen biology, disease cycle, and epidemiology. Plus, the article has many images and a chart illustrating disease cycle. 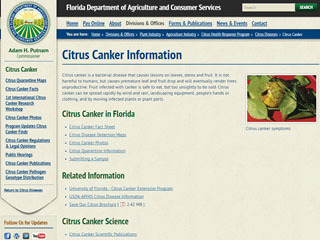 This page covers citrus canker in Florida, including a fact sheet, photos, and citrus quarantine and disease detection maps. 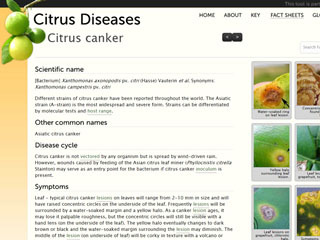 This fact sheet from ITP’s Citrus Diseases identification tool features many images and describes disease cycle, symptoms, host range, distribution and diseases citrus canker is easily confused with. 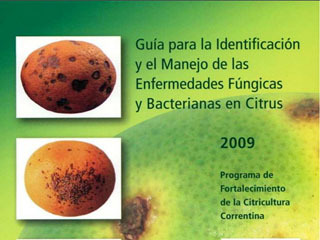 This PDF in Spanish covers over 15 citrus diseases with information on symptoms, hosts affected, and photos, illustrations, and comparative images of symptoms.